It takes wisdom and experience to navigate the webs of the courts in Otosan Uchi. Only those with the utmost experience and a true vision can cut through the intrigue of the courts to earn the Imperial Favor and bring assistance to their clan. 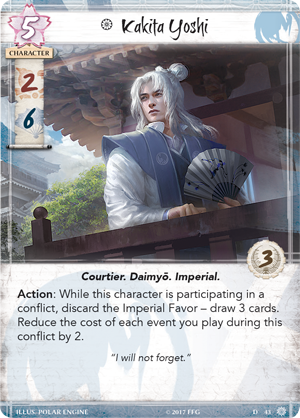 Who will rise above the rest, to navigate the intrigue of the forbidden city and earn the Imperial Favor? 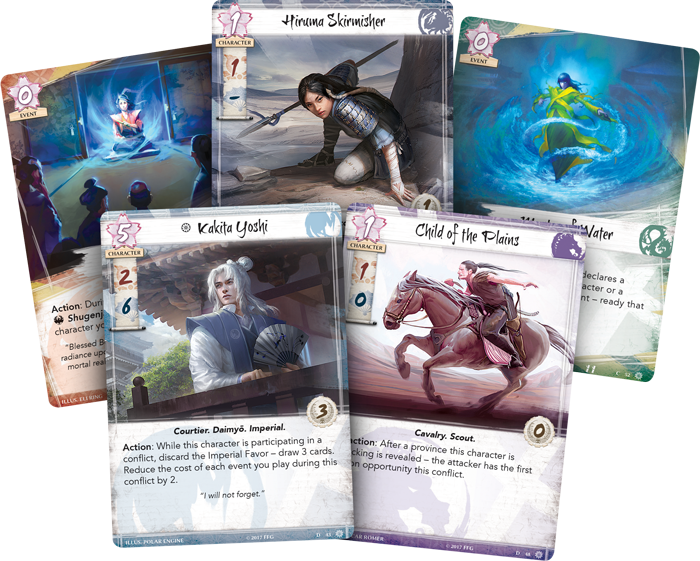 Into the Forbidden City, the third Dynasty Pack in the Imperial Cycle for Legend of the Five Rings: The Card Game is available now from local retailers! 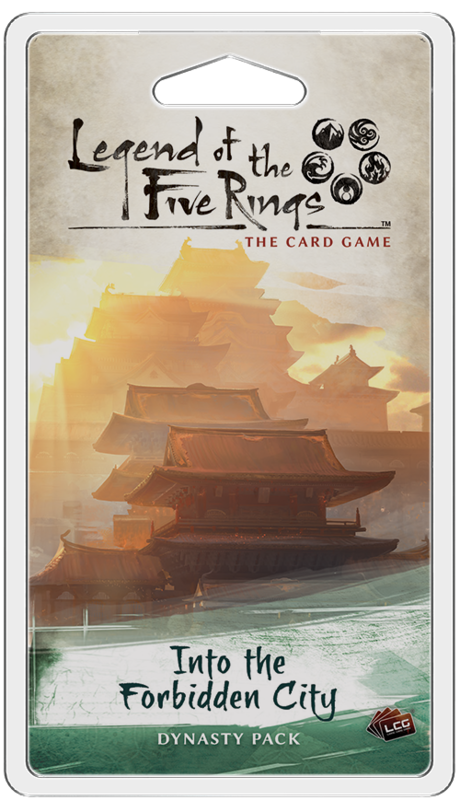 Into the Forbidden City introduces Kakita family daimyō Kakita Yoshi (Into the Forbidden City, 43) to Legend of the Five Rings: The Card Game. Kakita Yoshi is one of the most powerful men in the Empire. Though the Kakita family are often known for their dueling prowess, his strength is not that of a sword, but his skills at court. With a massive six political skill, Kakita Yoshi can make an impact in any political conflict with his skill value alone. However, if you have the Imperial Favor, Kakita Yoshi reveals his true strength. 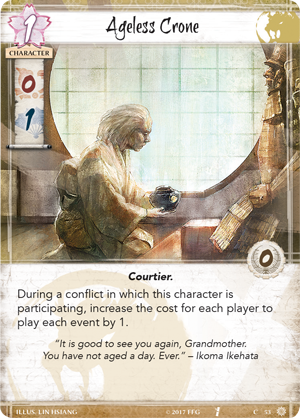 By discarding the Imperial Favor while Kakita Yoshi is participating a conflict, you may draw three cards. Then, every event you play during that conflict has its cost reduced by two. Drawing three cards is enough of a boost of on its own, but reducing the cost makes the potential of Kakita Yoshi near unlimited. 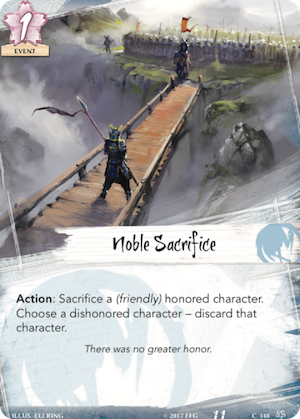 High-impact events like Noble Sacrifice (Core Set, 148 ) and Admit Defeat (Core Set, 147) suddenly become easier to play, and whichever clan the Crane decides to include in their conflict deck reaps this benefit as well. Of course, Kakita Yoshi does not do nearly as well in military conflicts as he does in political conflicts. Luckily, the Chisei District (Into the Forbidden City, 44) helps shore up this weakness by preventing military conflicts from taking place at Chisei District’s province completely. 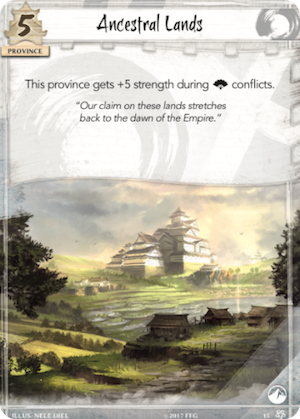 If you're fortunate enough to reveal this holding in your Ancestral Lands (Core Set, 15), you could ensure that your opponent will have to overcome the massive strength boost the province receives during political conflicts. 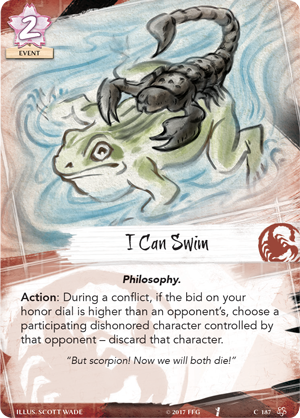 The Crane are constantly in conflict with the Lion, and while they cannot compete directly in a political arena, the Lion have developed strategies that oppose Kakita Yoshi and his political tricks. The Ageless Crone (Into the Forbidden City, 53) has been around a long time, and encourages the Lion to overwhelm their foe not with cunning events, but with their own honorable characters. Whenever the Ageless Crone is participating in a conflict, the cost to play an event—for every player—is increased by one. 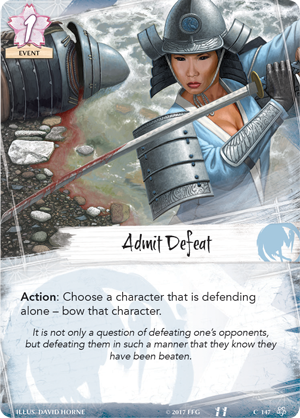 Not only does this lessen the impact of Kakita Yoshi, it can throw off your opponent’s economy completely: the fate they were saving for an event like I Can Swim (Core Set, 187) suddenly becomes worthless, as the Ageless Crone pushes the event just a little out of their price range. The Lion Clan's powerful warriors make them rely less on conflict cards, and they often times bid low during the draw phase to maintain their honor and sap some honor away from an opponent. 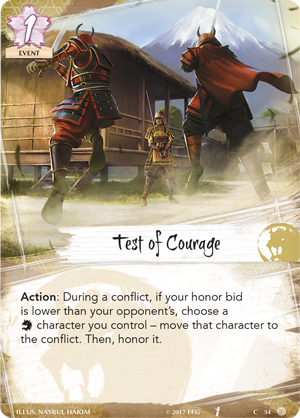 This tactic works especially well with Test of Courage (Into the Forbidden City, 54), which lets you pull a Lion character into a conflict and honor it, so long as your honor bid is lower than your opponent’s. Test of Courage puts a focus directly on honoring Lion characters, boosting their skills and your honor when they leave the field. With Test of Courage, you can afford to send a more conservative force to a conflict and then throw in an additional character if it is needed. The Imperial City of Otosan Uchi is a dangerous place, requiring political acumen and knowledge to navigate the courts. Do you have what it takes to earn the Imperial Favor and lead your clan to victory? 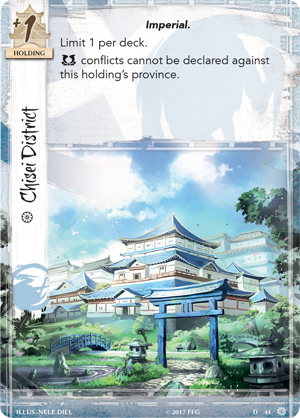 Travel to Otosan Uchi with Into the Forbidden City (L5C04), available now at your local retailer!